Winter is coming, so you know what that means…figure skating! And, this isn’t just any year–it’s a we’re-heading-into-another-Olympic-cycle year! The double exclamation point opening doesn’t begin to describe my excitement. I have loved figure skating since I can remember. I had a Dorothy Hamill doll, I was completely confused and upset that Tia and Randy had to pull out of the 1980 games, I thought (and still think) Scott Hamilton’s outfit from the 1984 games was a bit tight albeit patriotic, I watched the battle of the Brians on pins and needles in ’88, I cheered when Kristi Yamaguchi won in ’92, and I was caught up in all the drama that was the 1994 games for figure skating (which is soon to make a reappearance in a theater near you!). Although I have kept up with figure skating as best as I could over the past few years, the 1994 Olympics and that period of skating has really stuck with me. Back then, I watched as much as was televised, from amateur (now known as “eligible”) competitions, to the professional ones, and even the cheesy exhibitions. To this day, my sister makes fun of me this time of year for past years’ cheesiness. 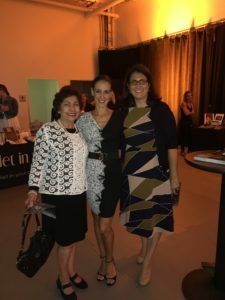 So, what does figure skating have to do with Sonia Rodriguez’s “A Ballerina’s Legacy” presented by Ballet in the City (Figure 1)? Exactly. As I have mentioned in previous posts, Mom loves ballet, so we are constantly on the look-out for special shows throughout the year here in Cleveland that feature ballet. 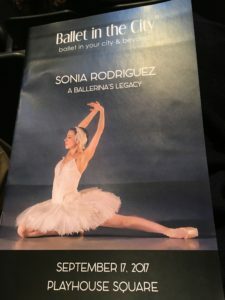 Last fall, we noticed a billboard advertising a night of ballet with Sonia Rodriguez at the Westfield Insurance Studio Theatre in Playhouse Square. A quick search for tickets online revealed that Sonia Rodriguez is a Principal Dancer with the National Ballet of Canada. Oooo, this was going to be good! Wait, what else did I see online about her? She’s married to fellow Canadian Kurt Browning, four-time world champion and figure skating’s showman of the 1990s?!? Get out! And, then it dawned on me….I have seen her before in one of those televised cheesy figure skating exhibitions! I distinctly remember that Sonia Rodriguez was featured in one of Kurt Browning’s numbers where at one point he skated with her in his arms. The announcers mentioned that they were engaged or recently married, which they did so in 1996. Sadly, I could not find a video of the show I remember from the early nineties, but I did run across a few gems from back in the day. While I had all of this in the back of my mind when we arrived for the performance, it all took a back seat when the ballet started. Sonia danced four solos, which included excerpts from Giselle, Sleeping Beauty, and Swan Lake. Set to live music, her fourth solo “Vientos del Sur” was choreographed by Sonia herself for a performance celebrating her induction into the Canadian Walk of Fame. What made this program stand out was the narrative and flow of the production. Sonia basically took the audience through a dancer’s experience during a show, complete with warm-up and costume changes. Sonia was also joined by fellow Principal Dancer Piotr Stanczyk, and together they held a mini-master class for male dancers on the importance of supporting a partner during a turn. Figure 3. I don’t think I need to point out which of the three is Principal Dancer Sonia Rodriguez (Cleveland 2016). Figure 2. 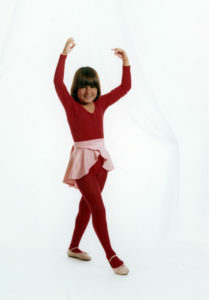 Briefly a ballerina, circa 1980. After the performance, Mom and I attended the reception which included a meet and greet with the dancers. We were a bit sheepish to get in line given that most in line were a quarter my age, but Sonia was gracious and signed our playbill while making polite small talk. Was I a dancer? No, although my Mom tried her hardest (Figure 2). Did you enjoy the performance? Oh, yes! And, by the way, I am a big figure skating fan and I remember you doing a duet with your now-husband Kurt Browning back in nineties! With nary an eye roll, Sonia posed with the two of us for a picture (Figure 3) before turning her attention to the next admirer in line. Posted in Cleveland Calculus and tagged Ballet, Dance, Figure skating.